Dan, his wife, Carol, and granddaughter, Vayda, visit the zoo in April. A promotional photo of the "KFDI Pony Express News Team." From left: Ken Vandruff, Becky Zoglman, Dan Dillon, John Wright and Bill Roy. Dan reads to his granddaughter, Vayda. An older fleet of news cars. Dan says storm coverage really shortened the lifespan of the earlier vehicles. Wichita is a city with people from many cultures and backgrounds. A jigsaw puzzle made up of colorful and interlocking pieces. But how much do we really know about the people that live here? Long-time Wichitan Dan Dillon talks about his Omaha days, meeting President Ford, "Ol Mike" and the KFDI crew, and his new job with the Sedgwick County DA. Dan sits in the KFDI News studio, several remodels before the way it looks today. Nebraska native Dan Dillon moved to Wichita almost fresh out of college in 1979 to be News Director of KFDI. It was one of his first radio jobs since graduating with a degree in broadcast journalism from the University of Nebraska-Lincoln. 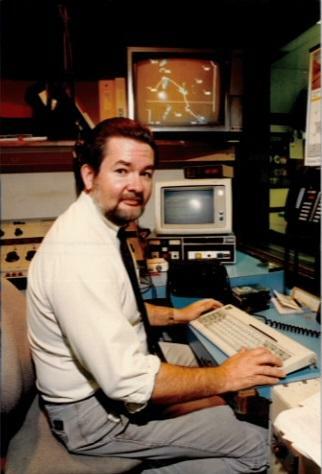 In the 34 years that followed, Dan Dillon became the signature voice of KFDI news--especially when severe storms and tornadoes rolled into the Wichita area. Sometimes, Dan would get up at 3 am to host the morning news, only to return to work that evening to anchor weather coverage until the early morning hours. A little over a year ago, Dan set off for a new adventure as the Media Coordinator for Sedgwick County District Attorney Marc Bennett. Long-time colleague George Lawson was kind enough to share some of Dan's work during his years at KFDI. Listen below for examples of Dan's court reporting and storm coverage. Dan reports on the murder trial of Nathaniel Bell. Dan reports on severe storms in the Wichita area. Actor and comedian Chris Maslen was born in Kansas, but has spent most of his life in Seattle, Washington.